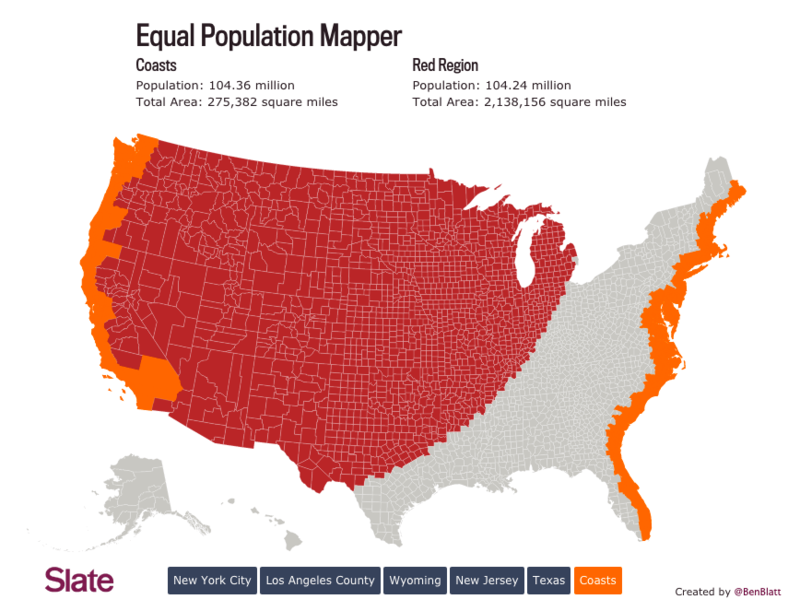 The good folks at Slate introduced a creative mapping tool, dubbed the Equal Population Mapper. 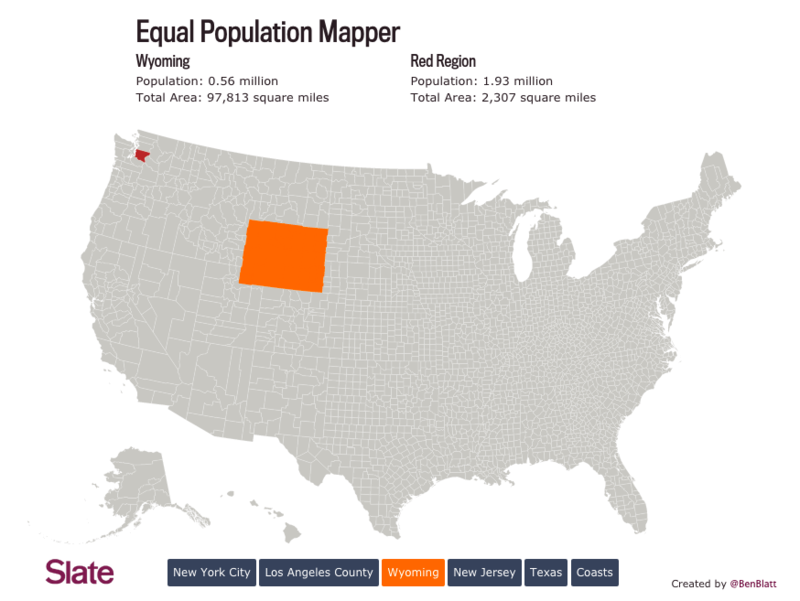 This interactive graphic allows users to pick a population center (e.g., New York City, Wyoming, the Coasts) and compare its relative density to any area of the United States by selecting a County and watching the map fill in the surrounding area until an equal population is covered. “Density” is a word we throw around a lot in conversations about urbanism, but on a local scale (urban centers vs single family neighborhoods, Seattle vs the suburbs). This map helps visualize density on a grander scale, allowing users to compare a City to an entire region and elevate the way we think about planning. New York City is the most populous city in the country and 21st in the world with 8.18 million residents across 469 square miles. Seattle, by contrast, is home to just 650,000 residents across 142 square miles. Washington State is closer, with a population of 7 million. 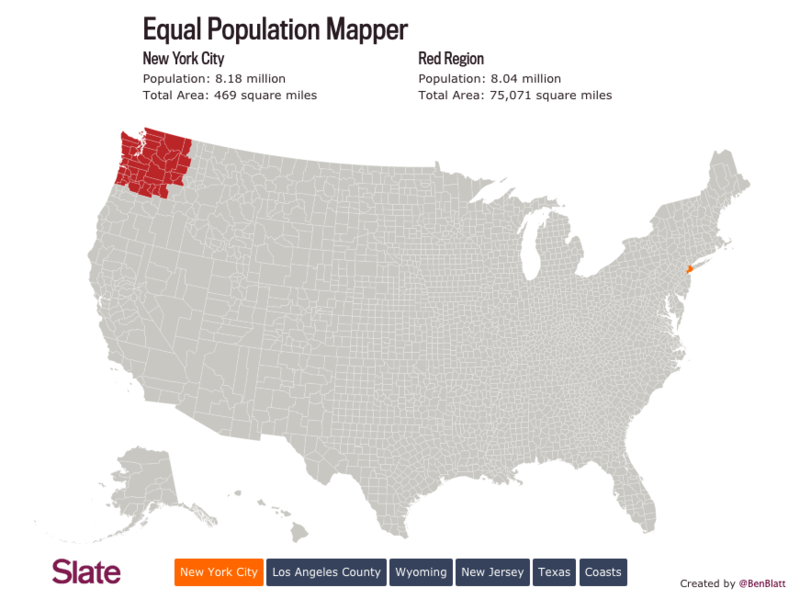 But it’s not until the Portland metro area is included that we match the population of a single city. 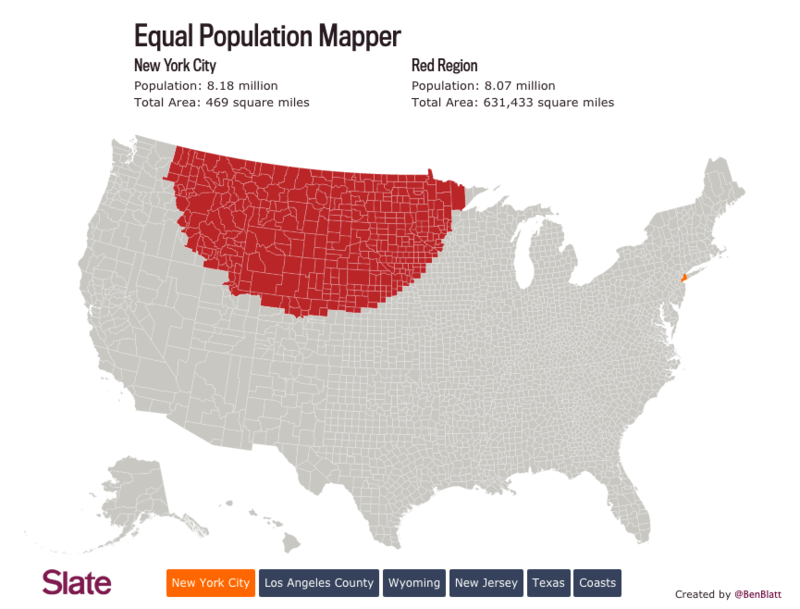 Moving westward to the sparsely populated West, it takes the combined effort of Montana, Idaho, Wyoming, North Dakota, South Dakota, Minnesota, and Nebraska—that’s 631,000 square miles—to match the population of The Big Apple. That’s a relative population density of 1346:1. Such low density makes providing services like public transit largely impractical. New York City’s subway system, for example, serves an annual ridership of over 1.7 billion with just 232 miles of track. That system would be impossible to replicate in most of the country, leaving many dependent on single-occupancy vehicles to travel between their destinations. It may come as no surprise that one of the densest area besides New York City is the area immediately around it. Indeed, the map almost exactly outlines what is considered the greater metropolitan area, including counties in New York State, New Jersey, Connecticut, and Pennsylvania. Wyoming vs Seattle is no contest, with King County outmatching the Western state in population by almost 4:1 in a land area 42 times smaller. Our county is home to parts of four Congressional districts to Wyoming’s one. Meanwhile, Wyoming maintains two Senators, leading some to criticize the apportionment of political representation. 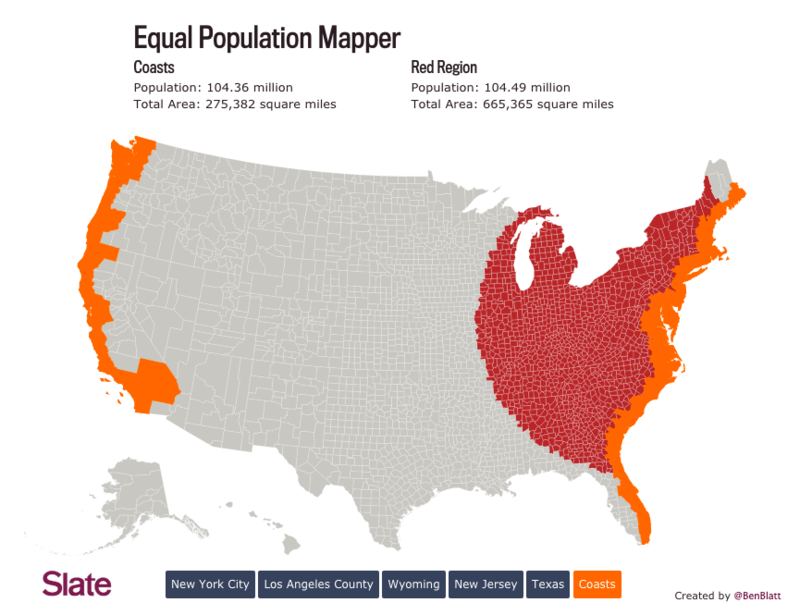 The Pacific and Atlantic coasts account for a third of the country’s population, coming in at over 100 million residents and encompassing many of the most populous cities, from New York to Miami, from Seattle to San Diego. It takes more than two-thirds of the land area in the Western part of the country to match the population contained in just one-tenth. The East is significantly denser than the West, even without the major metropolitan areas contained within The Coasts like Boston and New York. It matches the population in just 665,000 square miles—that’s three times less than the West. This disparity emanates from the way our country developed, with settlers moving West and claiming larger plots of land, compelled by a sense of manifest destiny. 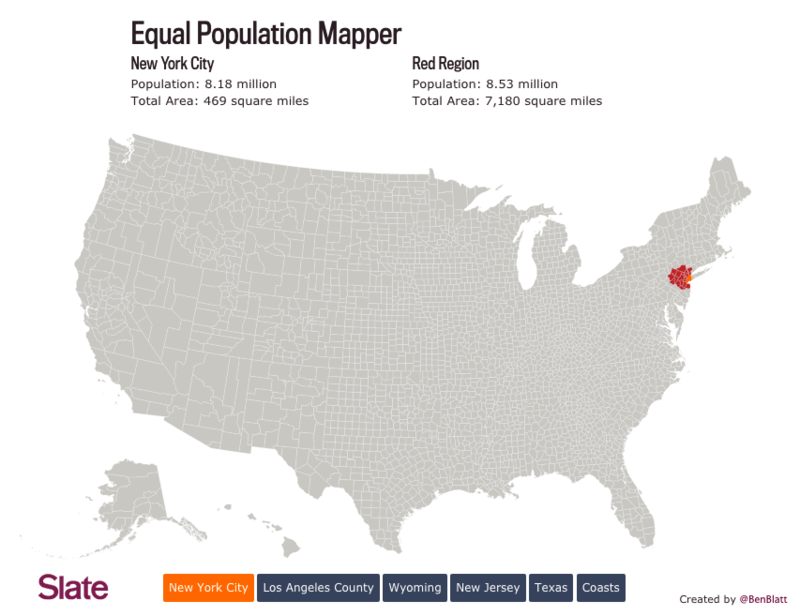 Explore the population mapper for yourself and see what patterns you can find.